The Starling is a common passerine bird that can be found in temperate reigons throughout North America and Europe. It is a black songbird that has shiny green and purple feathers over its entire body. This bird has an average weight of about 78 grams and has a wingspan of about 35 cm. Also, the chord of a starling’s wing is about 12 cm meaning that the wingloading of a common Starling is about 18.21 N/meters squared. 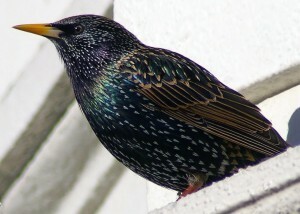 The Starling is most well know for its incredible ability to fly in formations that can contain as many as 5,000 birds. The starlings appear as if they are connected as they fly through the air in synchronous motion. This provides safety to the birds because when they are attacked by a predator they are able to react in unison and disperses and quickly regroup into formation. Also, the starlings manevuver at high speeds, make sharp and rapid turns, and hardly get into collisions. Bellow is a clip of a group of starlings flying in formation near Oxford, England. For many years scientists have been trying to explain how the starlings are able to fly in such close proximities without ever colliding with one another. There have been several possible explanations for how the starlings are able to do this. One suggestion is that there is a leader in each formation that chooses the flight pattern and the rest simply follow. More bizarre ideas are that the birds communicate with each other through telepathy have even been suggested. Also, it was widely believed that a single starling communicates with all of the birds in each group. However, new studies have been conducted that suggest otherwise. Recently scientists have been able to take photographs of starlings during flight analyze all of the birds in the formation afterwards. Andrea Cavanga of Italy’s National Institute of the Physics of Matter explains that with new technology scientists are able to analyze exactly what goes on inside a flock of starlings. 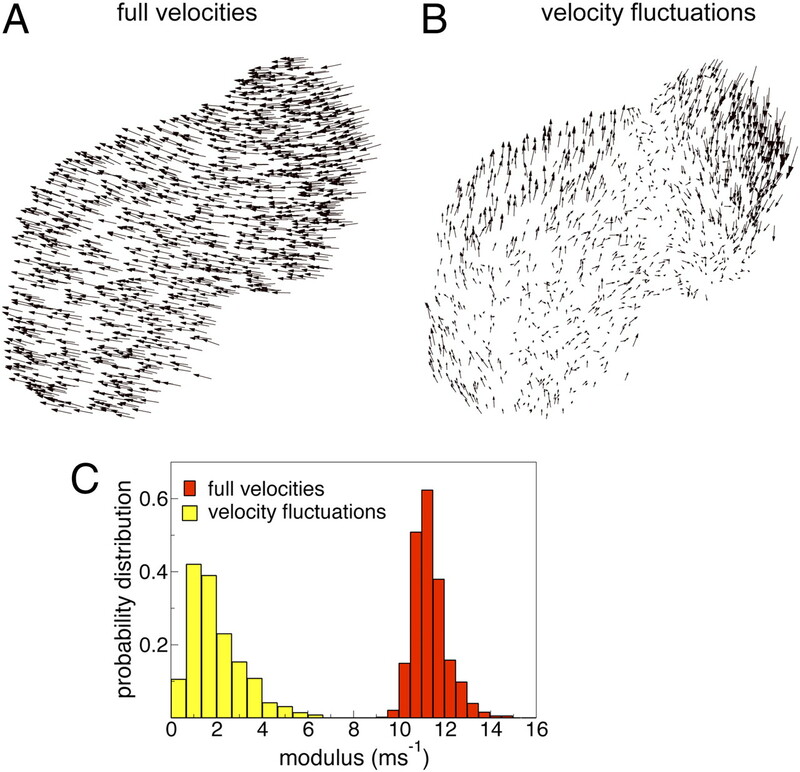 Above is the velocity vectors of starlings in formation. took pictures of the starlings. 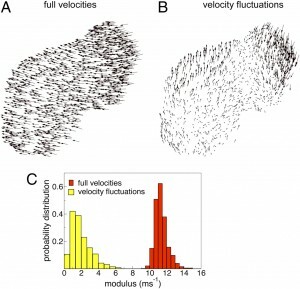 From this they plotted the vectors of velocity of each individual starling in the formation. Also, it was discovered that starlings can react to another birds movement in 100 milliseconds. Together, this information helps scientists to developed the new theory that starlings react to their neighbors. Regardless of distance, starlings react to about seven of their closest neighbors and then make their move based on those of the birds around them. This allows the groups of starlings to move in a way that makes them appear as a single entity. This study was significantly important because the way in which the starlings fly in formation is being applied to groups of robots that are being developed. From observing the starlings scientists are able to develop new technology for flying vehicle and non-flying robots. You give us a nice overview with relevant information, and good links to follow. Nice post!